Here we are on the North Shore again. Viv was with our daughter at her music class and I was stuck with the responsibility of taking our son to get a blood test. Yah, I got shafted on this one. There are not many kids, let alone adults, who enjoying having needles poked into their veins for the purposes of blood extraction. It's akin to being attacked by a vampire except it's behind the guise of friendly lab staff. We headed up to upper Lonsdale to do the inevitable. My son was getting a bit restless waiting for his turn and that would only be the beginning of an arduous experience. You see, his veins are not very visible; thus it is very diffic ult to poke a needle into the right place. The staff tried massaging his arm, putting a warm compress and the sort. This took 45 minutes. Finally, they poked him and missed the vein. It didn't help that he had moved his arm. Then, while the needle was still in his arm, they moved it around to try to find the vein. It looked painful! I gotta give it my son, other than a few whimpers, he toughed it out. If it were me, I'd be passed out on the floor. You'd think after that he'd want to run away faster than Tiger Woods in his Escalade. No, he let them do it again. This time on the top of his hand (which hurts more by the way). Finally after an hour, they got the 2 precious vials of blood. I was impressed at his resolve. I don't get it, he can put up with blood extraction; but can't even eat a freakin' hamburger... go figure. After that, we were off to find food. 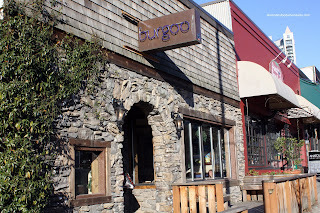 A bit randomly, we went to Burgoo at the foot of Lonsdale near the Quay. Why not, it's cold and comfort food seemed like a good choice. Besides, there are items such as grilled cheese and mac 'n cheese on the menu. Things I know my son would eat. Since I've already had the Kentucky Burgoo and other stews at the Point Grey location, I decided to go for a soup and sandwich combo. I naturally chose the Gooey Cheese Grillers (guess for whom) and Pacific Chowder. Viv also had the combo and selected the Chicken Caesar Clubhouse and Straight Up Tomato soup. We got a Mac 'n Cheese and Burgoo Biscuits as well. 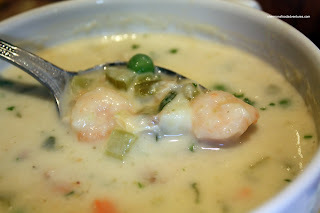 Despite lots of seafood, I thought the chowder was a bit thin and bland. This was not the case last time when Boss Woman had it at Point Grey. Not sure if this was an off batch or not. I had to add salt and pepper to give the soup some resemblance of flavour. On the other hand, Viv's tomato soup (reminded me of the blood earlier) was plenty flavourful with the exception of being a tad too sweet. At least it wasn't too tart. We both liked her sandwich, after all it had bacon! It really did taste like a chicken Caesar with bacon on a bun. The grilled cheese seemed to be a hit with the kiddies. They should've called it fried cheese since the bread was soaked in enough grease to make it translucent. 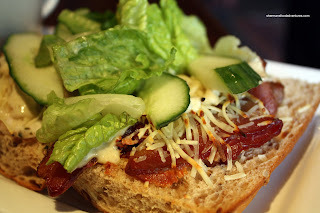 As described in the menu, it was 2 Filone sandwiches with melted Mozzarella, Gruyere, Emmenthal and White Cheddar. The result is a very crunchy sandwich with a much more complex set of flavours than a regular grilled cheese. Think of it as a crouton sandwich with high-end cheese. 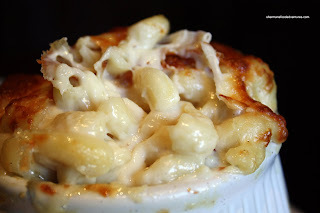 The Mac 'n Cheese didn't look all that big being baked in a modest-sized ramekin. However, it was rich and cheesy. The white cheddar top was perfectly golden and gooey. It was probably the best part! We liked how there was plenty of cheese flavour without being salty. However, I would've preferred that the cheese sauce was a bit smoother, I found it a bit gritty. 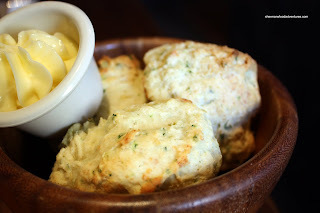 The Burgoo Biscuits were tasty as usual. Not as fluffy as I remember, it was still good with bits of chives throughout. Adding copious amounts of butter improved the experience. Nope, this food is not for those who calorie-count! you've got a brave little guy there. i had people move the needle like crazy while still in, it's down right ridiculous. i had one guy, at a lab in south graville that was considerate though, after a few trys on each arm, he resorted to using the smallest needle, the ones for babies to extract blood, it just takes slower for the blood to flow in the vials, but it's easier to find the vein. Yah, I'm surprised. I would've ran away screaming. But he did it. 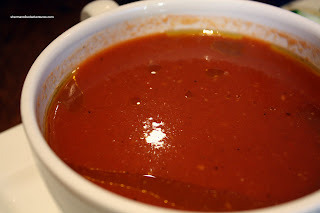 Doesn't the tomato soup look ironic? oddly i love getting blood tests. how bizarre is that? i have a thing for pain though. 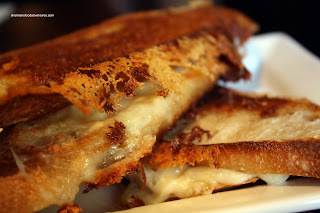 on a food related note... that grilled cheese looks sinfully delicious! Your son sure is braver than me. The nurses always have such a hard time finding my blood vessels and cause so much pain,that I always ask for the (more expensive) butterfly needle which they use on babies. You just have to request it before they put in the regular needle. It usually works on the first try.